The holidays are over. It’s time to exercise. If you live in snowy climes, that means it’s time to go skiing. But flying down a mountain at high speeds on a pair of sticks is…not safe. Between 2006 and 2016, an average of 38 people died skiing or snowboarding each year in the U.S.
And ski injuries are much more common than deaths. 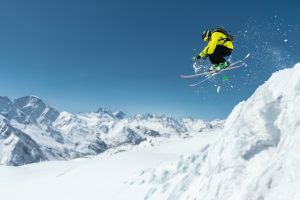 So how does insurance cover skiing accidents? Health insurance: If you are injured in the U.S., your personal health insurance should cover your medical expenses, depending on the specific details of your policy. What if you need to get airlifted out because of a medical emergency? Your health insurance might help cover that, but you should check with your insurance company. Travel insurance: Your personal health insurance may not cover all your medical expenses if you get injured abroad. (Again, it depends on your policy, so call your health insurer to make sure). That’s where travel insurance can come in handy. Make sure your travel insurance covers emergency medical assistance. This could cover situations like being airlifted off the mountain after a ski accident. Homeowners insurance: What if you accidentally injure someone else on the slopes? Your homeowners insurance may kick in to cover some of the liability you incur. Ditto renters insurance. But different states determine ski accident liability differently, and your homeowners insurance doesn’t cover everything, so talk to your agent to find out what your coverage is. Personal umbrella liability: Liability payments can be expensive. That’s why some people will buy a personal umbrella liability policy, which is basically extra liability insurance. It will cover some types of liability your homeowners insurance excludes – and will also cover higher payments, sometimes up to $1 million (homeowners is often limited to $300,000). What about the ski resorts themselves? They will typically have a commercial insurance policy to cover their liability and property damages. Ski resorts could face liability claims from injured skiers for poor slope maintenance, ski lift accidents, or accidents in, say, the ski lodge.